Curators for precious metals news, books, videos & more. If you are like most veteran coin collectors, you’ll create a coin collection for your children as an investment. Collections like these are kept safe over the years with the intent of handing over to the child at adulthood or as an inheritance. But why wait? In addition to video games, your child could be collecting coins. It would be a fun activity for you to share, and it teaches your child about saving money and investing. Below are tips about how to get started. How much money can your child afford to spend? How often will you purchase? What’s the ultimate goal of this collection? If the collection is meant to put your child through college or be a monetary investment cashed in one day, you’ll need to collect higher value coins like Silver Proof Sets, but if the collection is a hobby that may have greater future value, you can choose more budget-friendly Wheat Centers and Jefferson Nickels. These decisions will define your kid’s collecting goals, and budget, and determine what types of coins he or she will want to buy. Let’s say your kid-sized budget is between $30 and $100 annually. This budget allows coin buying at special holidays and your child’s birthday. The best coins for this budget are the national Mint Sets, or the yearly Proof set. The cost of Uncirculated sets is usually under $25. You can buy Proof sets for less than $40. Silver Proof Sets will run junior $50 or more. Children enjoy looking at Buffalo Nickels and Indian Head Pennies, so these are good choices for a starter collection. Mercury Dimes and pre-1965 Roosevelt Dimes are ideal for a tiny budget as well. The U.S. Silver Eagle is another great choice for a pint-sized budget. For a couple of dollars, your kid can invest in these one full ounce silver bullion coins, and if the price of silver rises, your child will have the benefit of increased value. Buy coin folders or albums to keep coins safe and so that your child has a place to display great finds. Filling an empty hole in the folder with a new coin is fun and satisfying for kid collectors! 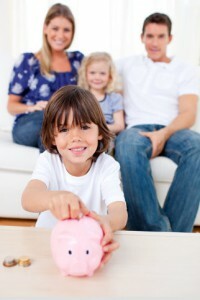 Teach your child to protect investments by choosing storage places wisely. Coins that your kid is actively collecting need to be hidden from visitors. Thieves will steal coins because they can easily be sold. Investment and heirloom coins, like silver quarters, halves and dollars, need to be stored in a safety deposit box. Establish good collecting practices from the get-go so that your child can enjoy his growing treasure for years to come.